Golden Technologies humbly started out of a garage in 1985 but has since grown and now operates out of a 122,000 square foot manufacturing facility. Golden's growth can be attributed to their commitment to building high quality chairs, chairs designed to meet the many needs of their customers. Golden Technologies lift chairs encompass every possible option on the lift chair market, whether your priority is positioning, fabric color, or space-saving capabilities. 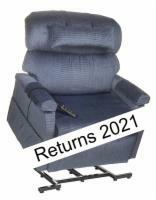 Contact our specialists today at 1 (800) 791-2407 and begin your search for the perfect Golden lift chair! 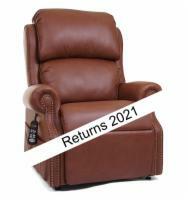 This button-back chair has a 2-position recline mechanism and SmartTek diagnostic system. 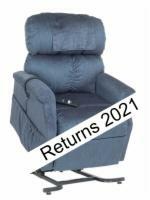 This seam-back chair has a 3-position recline mechanism and SmartTek diagnostic system. 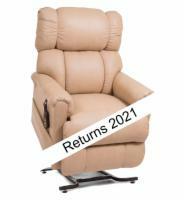 This 3-position, seam-back chair has a split chaise pad and plenty of other features to choose from. This traditional chair has a biscuit-back design and overstuffed cushions. 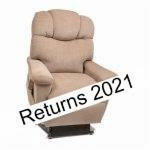 Floor to Top of Seat: 21.5"
This hand stuffed seam-back chaise lounger chair offers battery backup support and a SmartTek diagnostic system. 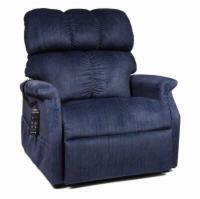 This hand stuffed seam-back chaise lounger chair offers great lumbar support and SmartTek diagnostic system. 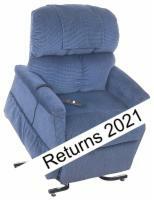 This hand stuffed seam-back chaise lounger chair and has Goldenrest's signature smooth and quiet lift mechanism. 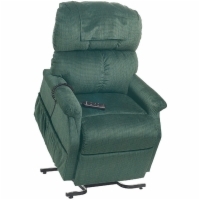 This hand stuffed seam-back chaise lounger chair comes equipped with a quick release hand control and a battery backup system in case of power outage. 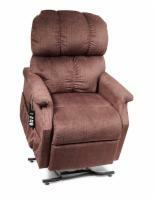 This hand stuffed seam-back chaise lounger chair has an extra wide seat and offers great lumbar support and SmartTek diagnostic system. This chaise lounger chair is ideal for people who have a smaller build. It has many features such as SmarTek Inside and a 6 button remote control. 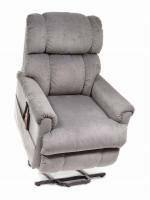 This chaise lounger chair has the popular infinite positioning and is designed for petite individuals. This chaise lounger chair uses Golden's exclusive "Zero Gravity" positioning mechanism and features the smallest frame in the series. This strong-framed lounger has an extra soft seat, back pillows with lumbar support, and comes with a variety of other features. This chaise lounger chair has zero gravity, infinite positioning that's great for improving circulation and a variety of other features. 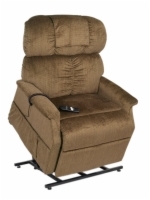 This lift chair is great for larger individuals who desire plenty of excellent features and a smooth lifting device. 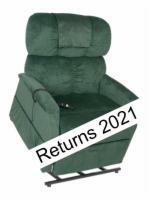 This hand stuffed seam-back chaise lounger chair is created for total body support and has a 500 pound capacity. This medium-sized chaise lounger chair employs MaxiComfort technology to allow you to rest in an exceptional number of positions. 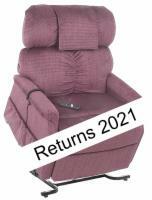 Features overstuffed cushioning, a full chaise pad, bucket seat design, and Zero Gravity positioning for the ultimate in comfort! This large-sized chaise lounger chair employs MaxiComfort technology to allow you to rest in an exceptional number of positions. Comfort and versatility have never looked better. The Golden Power Cloud PR512 is the ultimate in adjustable mobility tools. 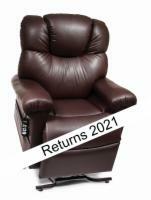 Find the perfect recline position, program it into the memory settings and enjoy personalized comfort. This heavy duty model operates on 3 motors and offers independent positioning.